Hello crafty friends – enjoying the weekend? It’s a beautiful day here but I’ve been in all day catching up with jobs and trying to get back on tracks with my list of cards that need doing! We’ve had such a busy week doing loads of fun stuff with the kids. We especially enjoyed our trip to LEGOLAND – we’ll be visiting again very soon I think 🙂 Thank you to everyone who sent their best wishes last week with regards to my bad back! It’s a little better now – I know it’s one of those things that just takes time to get right. 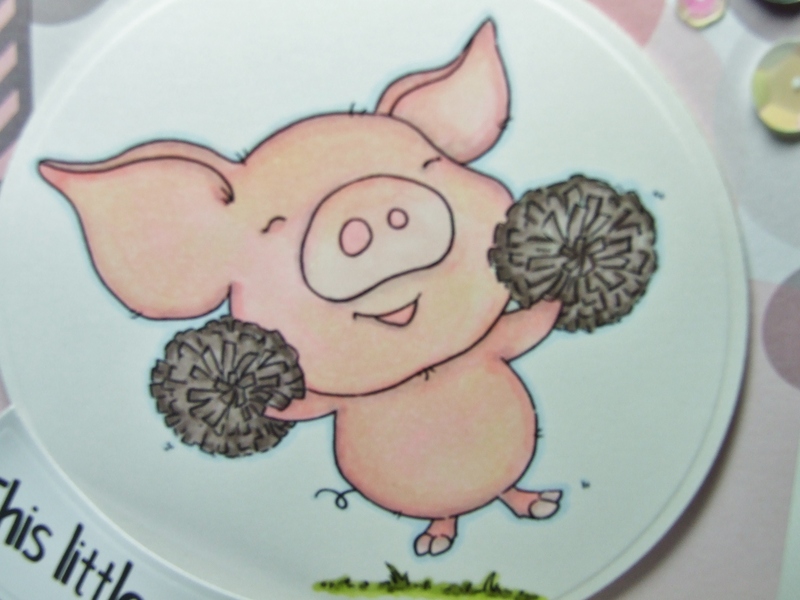 My card for this week is made using a digital stamp by fromtheheartstamps.com called ‘PigWit Cheer’. I saw this used by the very talented Jo Edwards on her blog siggi-shop.blogspot.com and had to have it – it’s just too cute! I know I’ve mentioned it on my blog before but my daughter LOVES pigs!! I have printed one off for her to colour in. I think she was hoping for Mum to do it but I said it would be good practice for her!!! There are several sentiments that come with this little piggy. I went for this one here so that inside it I can put “Happy Birthday to a Wonderful Auntie!” as this will be from my kids to my sister who’s birthday is in October. All the paper used here and the banners (that I stitched myself) are from a collection called ‘Candy’ by Craft Asylum. I have also used a Spellbinders circle and banner die. The image was coloured with Spectrum Noirs. Fabulous card, Karen !! Love all the different pink colors in combination with grey and you did a great job with coloring Hamlet. Isn´t that a cutie ?! Thanks for entering the DT Call @ From the Heart Stamps and i wish you good luck !!! Oh my word! I love this! Pink & grey is one of my fave combos, the layout is superb, as is your colouring of Hamlet too. FAB card, good luck with the DT call, thanks for entering, and thank you for the mention of my blog too (very kind). Sooooo Super Cute! Love the image…. You could even add little pom poms for the “pom poms”! Totally Adorable Card…. Great Job! Super duper cute! 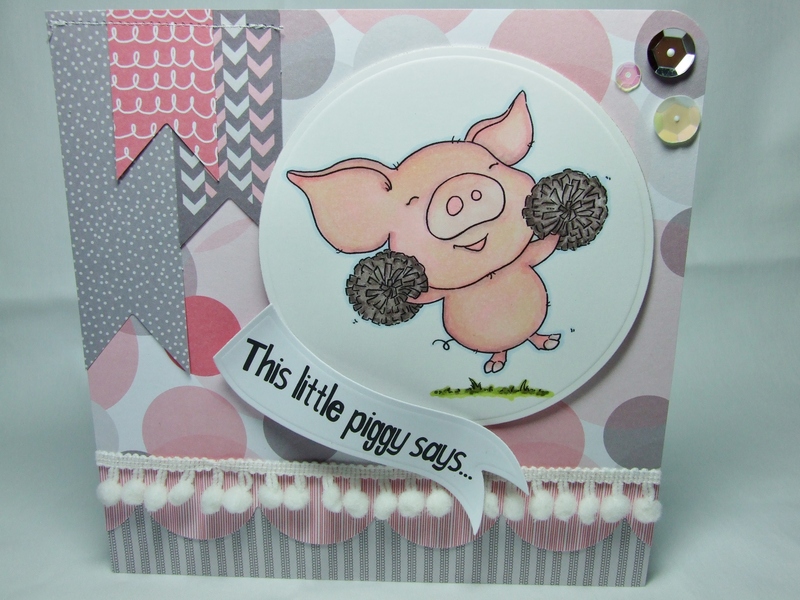 Love the color combo and that piggy is too cute! This is adorable! Colored beautifully and I love pink and gray together. Thanks for entering the FTHS DT call! 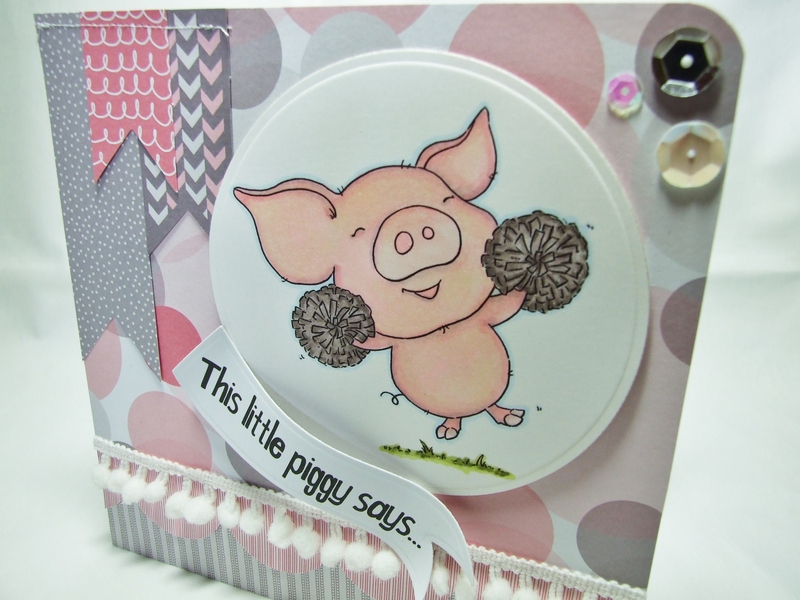 What a darling card with the pig…too CUTE!!! This is adorable, Karen! I love the colors you used and also the way you added the sentiment. Super cute and very creative! Thanks so much for linking up to the DT call!